No Contracts to sign. You "Pay As You Go," with no cancellation fee. We have fun and informative Kickboxing Classes from 6:30 AM to 8:30 PM, for beginners to the advanced, taught by our respectful and attentive professional instructors. You get a great cardio workout, and also learn real Kickboxing techniques and develop real self defense skills. And there are no Kickboxing Contracts to sign at Victory. You “Pay As You Go,” and cancel your membership if you need to, with no cancellation fee. We guarantee the “Best Kickboxing Instruction” in San Diego, a clean and professional gym, and the upmost in customer service, or your MONEY BACK! 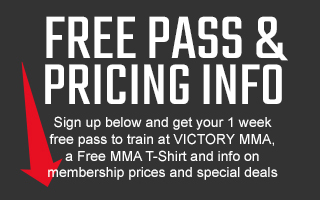 SIGN UP FOR YOUR FREE WEEK OF KICKBOXING AND A FREE T-SHIRT! Our Kickboxing Instructors have decades of experience training professional fighters, and conducting informative and fun classes for beginner to advanced members. Our professional Coaches teach all aspects of the Boxing game. In addition to being a superior workout that will develop invaluable self-defense skills, our classes are the perfect combination of cardiovascular and muscular training. Our Instructors will take you though their very own specialized workout which mostly includes "one on one" routines and combination drills with a partner, but also includes stretching, skipping rope, shadow boxing, bag work, lower-body conditioning, and abdominal work. Our Kickboxing Classes are great for beginners who will learn valuable real life self-defense and fighting skills, and also excellent for both intermediate and advance students. These classes require hand wraps and boxing gloves, which we loan "free of charge" to guests and new members. Bring a towel and dress to sweat! And if you want to bring those Kickboxing skills into the ring, we can train you to become an amateur or professional Kickboxer, and we can assist you with choosing the right event and the right opponent. Join for as little as $59.00 a month, or less depending on current sales or qualifying military or other discounts, and enjoy more than just the best Kickboxing Classes in San Diego. Your membership also includes Boxing Classes, Muay Thai Classes, Yoga Classes, and Conditioning Classes, as well as unlimited “Guest Pass Privileges,” eight private showers, sauna, acupuncture and massage services, a large lounge to socialize and prepare for your classes, and team building social events. We can also include Jiu-Jitsu Classes and CrossFit Classes for a small additional cost. SIGN UP FOR A FREE WEEK OF KICKBOXING AND A FREE T-SHIRT!